This weekend sees a return of the Blockupy demonstrators to Frankfurt and as a result there will be changes to public transport services in the city centre. From Thursday, 30th May 2am until Sunday, 2nd June, at 4am, the U-Bahn station “Willy-Brandt-Platz” will be closed. The lines U1 to U5 and U8 will travel through without stopping. The U5 will be running later into the night to ease changes at other stops. 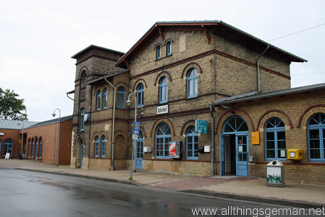 Last year when I visited the Störtebeker Festspiele on Rügen for the second time, I considered going by train. The reason for this was quite simple: it takes about 8 hours to drive there from Oberursel, and that’s without the breaks or any traffic jams! So when I heard about a train (IC 2355) that went from Frankfurt am Main to Bergen auf Rügen without having to change en route it sounded like a good alternative allowing me to get some work done during journey or just relax and enjoy the scenery. However what sounded easy at first, turned out to be considerably more complicated. For a start I would probably need to find somewhere else to stay on the island, as I was not aware of any way to get to the guesthouse that I had stayed at the year before using the public transport network. The travel information that was issued several days ago for Frankfurt am Main has proved not always to be effective. 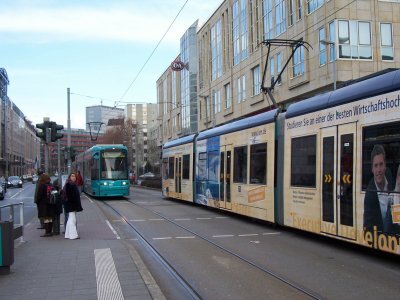 On Thursday, one protest caused the station “Dom / Römer” to be closed, and today the protests have moved around the city causing various tram lines to close at one time or another. The area around the main station (Hauptbahnhof) was also affected. Since there is an approved march taking place in the city tomorrow, new travel information has been issued. Between approximately 12 noon and 5pm the tram lines 11, 12, 16, 18 and 21 will be shortened even further as will bus route 36. The stations “Willy-Brandt-Platz” and “Taunusanlage” on the U-Bahn and S-Bahn lines also remain closed. Further stations may be closed on order of the police if deemed necessary. For up-to-date travel news in German on Twitter follow @vgf_ffm or @allthingsgerman for updates in English.